Although the original 10-minute version appeared on both the Into Battle release in 1983 and the Who's Afraid album in 1984, "Moments In Love" wasn't released globally as a commercial single until 1985, when the song was featured on the "Pumping Iron II: The Women" soundtrack. Reissues followed in 1986 and 1987, in some markets. Copyright dates indicate the edits & remixes were prepared in 1984. Singles generally featured shortened edits of the album version. The 12-inch remixes were "Moments In Love (Beaten)" and the slower "Love Beat". On the Daft compilation, the former was retitled "Love", and an edit of the latter was called "(Three Fingers Of) Love". 12-inch and CD singles also included an edit of "Beat Box (Diversion One)", listed on the releases either as "Beatbox Diversion 10" or just "Beat Box". In the US, "Moments In Love" was later paired with "Close (To The Edit)" as a double-A-sided reissue, accounted for separately in Discogs. The 1999/2000 remixes were triggered by Rob Searle's bootleg mix "Moments In Time" and would eventually end in a cancelled release under the 'Vision' moniker. Blocked from sale?? Wtf?? There's so many bootlegs on scogs, how's this different? 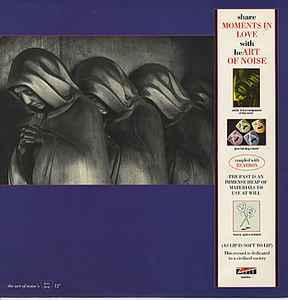 Before its release as a single in April 1985, Moments In Love was released four times over a nineteen month period on the following records: Into Battle With The Art Of Noise; Beat Box; Closely Closely (Enough’s Enough) and the album (Who’s Afraid Of?) The Art Of Noise! To a large number of people, that amount of exposure made the track sound tired and only die-hard Art of Noise & ZTT fans/collectors embraced it as a single in its own right. In August 1985 something unexpected happened, Madonna and Sean Penn replaced the Wedding March with Moments In Love at their wedding, giving the track some notoriety. It soon began to appear on various artists compilations, TV commercials, background music and whatever medium it could lend itself to. Following the success of Brylcream’s 1986-1987 advertising campaign that used LoveBeat in their commercial it was reissued in Europe, reaching the top ten in the Netherlands. ZTT then re-issued the single in the UK with improved artwork and a new video. Since then no less than four remixes have appeared on a couple of ZTT compilation albums, but never issued as singles. One that almost got issued as a single was Rob Searle’s Anthem Mix thankfully it was withdrawn from shops before its official release date. Twenty seven years after Moments In Love first appeared it was released as a digital download, peaking at #27 on Billboard’s Jazz Digital Songs in the USA and spent at least eighty seven weeks on that music chart. For the first time in thirty years and as part of Record Store Day 2017, Moments In Love is being officially released as a vinyl single by ZTT/Salvo/BMG as a newly redesigned limited edition 10” shaped picture disc. Side A retains the 1985 7” version that also appeared on the 1987 reissue and is the only edit that actually works due to the complex structure of the track. A Time To Fear (JJ’s 12” Remix), released on vinyl for the first time, is the third track to appear on side B, following Beat Box (Diversion Ten) in 1985 and LoveBeat in 1987. Listening to it on this single makes the track stand out as it was originally intended to be, as an individual track to be enjoyed for what it is, bring a new dimension to the piece, rather than becoming lost to a certain degree on a full length compilation album. As a general rule vinyl picture discs can be hit & miss regarding sound quality, but having listened to this a couple of times I can say that it is one of the better ones that have been issued over the years. The sound has depth to it and is not drowned out by surface noise that can make these kind of records seem rather flat, spoiling the listening experience. The artwork was designed by Philip Marshall with Oscar H. Scott, assisted by Julia Schiller and is a new take on Paul Morley’s “the tortoise and the hare” theme that replaces the original tortoise shaped picture disc with a hare shaped one derived from XLZTT’s original masks. This brand new design is faithful to those from the 1980s, keeping the humour of Art of Noise by giving a nod to the Edited 12” picture disc, at the same time looking different and original enough to become as iconic as the classic 1985 edition. One of the most beautiful album and songs ever made. So quiet and relaxing. The version of LoveBeat here has yet to appear on CD. The "..And What Have You Done With My Body, God" box set made a valiant attempt, but sadly got it wrong. The cassette version has no talking at the beginning of LoveBeat. "(Three Fingers Of) Love" on Daft is close, but still not the same. Which is all a great shame as the transition here from Beaten into LoveBeat is sublime and deserves a re-release. On the smooth unpressed side the etching DAMONT AUDIO L.T.D appears twice, facing inwards and tight against the white label. On the music side only DAMONT appears underneath the matrix number, both face outwards from the label, as is the norm. All these etchings are the rough hand-written variety, not neat type-face letters. The clear plastic layer in many copies of this release has turned a brownish color over the years, as if someone has spilled tea or cola on it. This "tea-staining" is said to be due to oxygen getting in between the layers and is a common manufacturing flaw that can affect picture discs at any time, even if they've been clear for years. (My own copy, fortunately, is still in good shape. After 30 years, mine is starting to discolor as well!) If you are buying one, please check with the vendor as to its actual condition, and whether any browning is irregularly shaped; I would not pay a premium for one that looks bad.